Notes: The new station at Pelaw was approved in September 1854 and it had opened by 1857. Its structure was to incorporate a large quantity of materials, such as platform roofing, salvaged from the former main-line junction at Brockley Whins, where they were no longer needed. The station is shown on the OS plan of 1897 to have possessed an island platform with a lengthy narrow building on it. In fact this station had closed in the previous year, as the third Pelaw station had opened almost on site of the original facility. From 1872 Pelaw became a three-way junction when the South Shields branch via Hebburn opened. In summer 1896 Pelaw station was served by trains on the three lines which diverged to its east. South Shields trains ran approximately hourly in each direction on weekdays, with eight to, and nine from, Newcastle on Sundays. The Sunderland service was irregular with 17 up and 15 down train calls on weekdays and six in each direction on Sundays. On the Washington route there were nine up departures from Pelaw, one extra on Thursdays and Saturdays, and four trains on Sundays. In the down direction there were eight weekday trains, and extra on Saturdays, and three departures on Sundays. This second Pelaw station was referred to as Pelaw Junction on OS plans and by Bradshaw between 1856 and 1893/4. Bradshaw from Chris Totty, Route maps drawn by Alan Young. Eastleigh-built South Tyneside EMU is threading its way from the South Shields branch to the down slow line past the site of the second station and is approaching Pelaw (3rd) station where it will call. The South Shields electric service ceased as an economy measure in January 1963, and the trains returned southwards to see their days out on Southern Region suburban duties. Just under 20 years later the route was re-electrified for the Metro. A steam loco is seen on the right where the rails curve away towards Washington and Leamside. 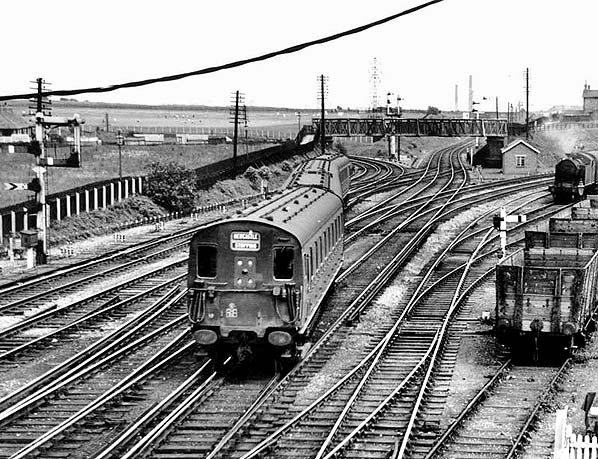 In September 1970 a DMU is heading towards Sunderland from Pelaw (third) station having passed the second Pelaw site in the foreground. 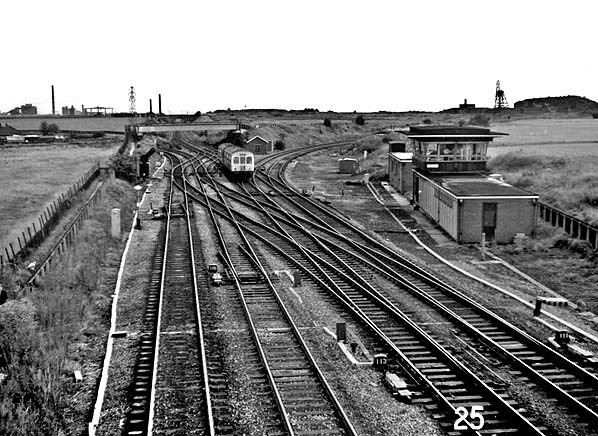 The Washington line diverges to the right just beyond the modern signal box which opened in October 1960. 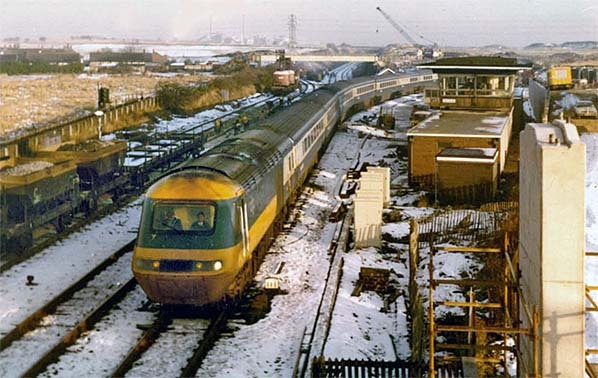 In late 1980 an InterCity 125 train is leaving the Leamside Line and heading for Newcastle. Pelaw signal box is still open at this time, and the works for the Metro are in full swing. 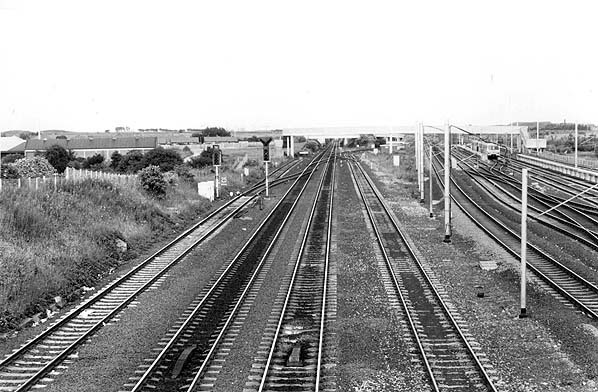 The site of Pelaw’s second station, looking west in July 1987. 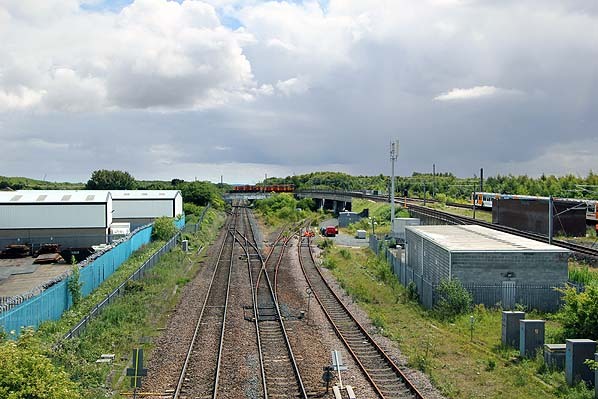 Looking east towards the site of Pelaw 2nd station in June 2011. The station was immediately before the divergence of the Sunderland route (ahead) and the Washington and Leamside line (right). There is now a flying junction where the South Shields branch meets the Sunderland line. A Metro train in red livery can be seen in the distance on the flyover on its way from South Shields to Newcastle.